Does Japan have a version of Thanksgiving? Let's find out! With Thanksgiving coming up soon here in America, it left me wondering about Japan: do they have a holiday similar to Thanksgiving? The answer to this question is “kind of.” November 23rd is Labor Thanksgiving Day in Japan. While it does have the word “thanksgiving” in its name, Labor Thanksgiving isn’t quite like the Thanksgiving Americans have come to know. Labor Thanksgiving Day or 勤労感謝の日 (Kinro Kansha no Hi) was made a national holiday in 1948 to commemorate how Japan’s postwar Constitution expanded the rights of workers, as well as established guaranteed fundamental human rights. The holiday gives citizens the opportunity to express gratitude towards one another for the hard work each person does every year. While most businesses remain open, government services close down for the day. Labor Thanksgiving Day is the modern version of an ancient ritual called 新嘗祭 (Niinamesai). This harvest festival consisted of the Emperor dedicating the year’s first harvested rice to the gods and then tasting it himself. A written record of this ritual first appeared in the 日本書紀 (Nihon Shoki), which dates back to 720 and is one of the oldest written accounts of Japan. It mentions a Niinamesai occurring in November 678, though the origin of the ritual likely goes back further than that. In the Meiji Era (1868-1912), it became a nationally celebrated event and was given the date of November 23 for its festivities. It’s hard to say whether or not the practices of Niinamesai still occur today. The Emperor may still go through the ritual tasks, but those actions would be behind closed doors within the imperial palace. As for the rest of Japan, a couple of things go on during Labor Thanksgiving Day. Children may go around to places like police stations and hospitals bearing thank you cards, pictures, or small gifts for the workers in appreciation for their services. The major event of the holiday, though, happens in Nagano. A labor festival sponsored by local labor organizations is held. The festival’s aim is to encourage others to think about issues such as human rights, the environment, and peace throughout the world. Another event that coincides with Labor Thanksgiving Day is the Nagano Ebisuko Fireworks Festival. It’s held on November 23rd every year to mark the end of the Ebisuko Festival. The event is named after Ebisu, one of the seven lucky gods from the Shinto religion. Long ago, farmers would come to the neighborhood around Nishinomiya Shrine and shop at bargain sales in preparation for the winter season. 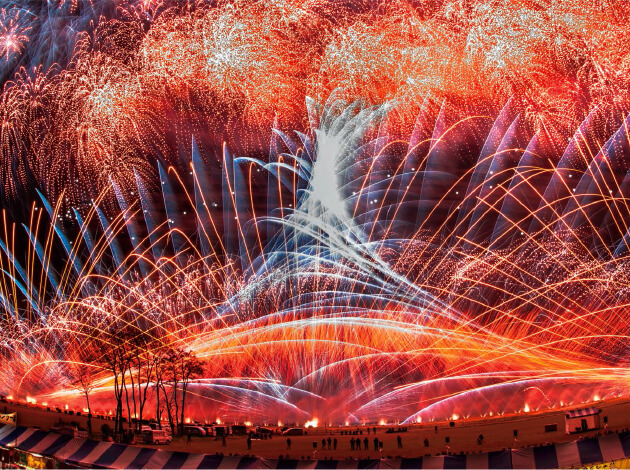 The festival’s current incarnation stems from an event in 1899 when some locals got together and volunteered to put on a fireworks display from morning until midnight. The display was to not only express their appreciation towards Ebisu but to also help boost their businesses. A large bargain sale was also held, and many people came to the area to shop. Thus, the fireworks display has remained a part of the festival. The Ebisuko Fireworks Festival is the only fireworks display held in the fall in all of Japan since fireworks are typically reserved for the summer. It proves to be a great opportunity to appreciate the artistry of fireworks before the winter season makes its way to the country. How do you guys celebrate Thanksgiving? Even if you don’t, is there anything you’re thankful for this year? Let us know in the comment section below! Yatta-Tachi Wishes You Happy Holidays!